The genome of a female Hereford cow has been sequenced, which could be a starting point for major improvements in the agricultural industry. Analysing this blueprint of DNA code for the chemical building blocks of the animal is revealing the unique role that many of the genes play. The information is likely to have a major impact on livestock breeding. The study, published in the journal Science, was a six-year effort by more than 300 scientists in 25 countries. Cattle now join an elite group of animals to have had their genome sequenced - a group that includes humans, other primates and rodents. "We chose to study the cow genome because these animals are of such immense importance to humans," explained Richard Gibbs from Baylor College of Medicine's Human Genome Sequencing Center, a leading contributor to the project. By comparing the results to other sequenced genomes, including that of humans, the researchers discovered how cows could help inform research into human health and disease. "We found that cows are much more similar to us than rodents are," said Professor Gibbs. "This is because rodents are evolving much faster. And it tells us aspects of human biology that we could actually study in cows." Of the 22,000 genes in the cow genome, 14,000 are common to all mammalian species. "These 14,000 are the common engine room of mammals," said Ross Tellam, a scientist from the Commonwealth Scientific and Industrial Research Organisation (CSIRO) in Australia and one of the authors of the Science paper. "The remaining genes are unique to each species." And many of the genetic features that make cattle unique are what make them so important to us. "If we can see precisely what genes cause the differences between each animal, there is an opportunity to enhance selective breeding," he explained. "We can use natural methods - simply selecting the best animals - to produce livestock that make more meat or more milk." This comparison between individual animals has already begun in a related study published in the same issue of Science. An associated scientific team has produced a map charting the key DNA differences, also known as haplotypes, between varieties of cattle. 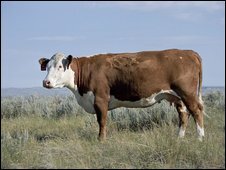 They compared the Hereford genome sequence with those of six other breeds. Using this bovine "HapMap", researchers can track the differences between the breeds that affect the quality of meat and milk yields. "[This map] will transform how dairy and beef cattle are bred," said Richard Gibbs. "Genetic tools are already being developed and proving useful to the dairy industry, and we predict they will be applied to improve the beef industry. "We hope the information will also be used to come up with innovative ways to reduce the environmental impact of cattle, such as greenhouse gases released by herds." The study has also identified new genes involved in the cows' immunity. These are linked to the animals' digestive system. Cattle are ruminants, which means they have a four-chambered stomach that contains a multitude of resident bacteria, allowing them to digest plant material, such as grass, that is very tough to break down. "We think these genes evolved in response to how vulnerable cattle are to microbial attack," said Dr Tellam. "Because of all the microbes that live in their rumen, and because the animals live in such large herds, they are very vulnerable to disease."